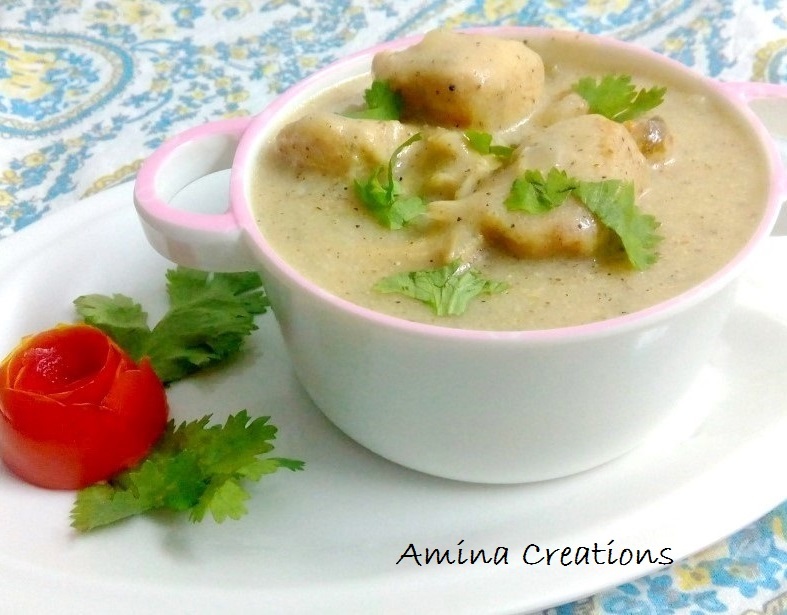 White chicken gravy is a delicious and flavourful gravy made with curd and white pepper powder. It is a quick to make gravy and goes well with chapathi, naan, pulao or any other rice variety of your choice. Melt butter in a pressure cooker, add onions, cardamom and cinnamon and sauté till the onions turn golden. Add ginger garlic paste and sauté till the raw smell goes. Next add in the chicken pieces, salt and white pepper powder and mix well. Add 1 cup water and close the lid of the pressure cooker. Pressure cook for 2 whistles and switch off the gas. When all the steam has come out, open the lid and bring the gravy to a boil. Dissolve cornflour in 2 tbsp water and add to the gravy. Mix well and continue cooking for a couple of minutes till it reaches a thick gravy consistency. Switch off the gas and transfer to a bowl. Garnish with tomato rose and coriander leaves and serve hot.